US, 1976, 100 minutes, Colour. Robert F. Logan, Susan Damante Shaw. 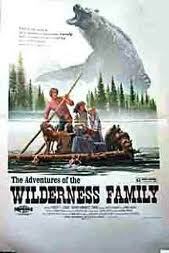 The Wilderness Family was very popular in the United States presenting a typical American family fleeing the polluted and busy cities and trying to live by themselves and their own resources in the Rockies. It is conventional adventure material with echoes of such old stories as The Swiss Family Robinson. The film is attractive in its presentation of the Rockies, the animals both friendly and dangerous. There is enough excitement to keep the attention of young audiences. Robert F. Logan is the star and continued the successful series into a sequel and an alternate on the same story called Shipwreck. Parents watching the film might have reservations about the judgment and behaviour of the children, especially the young boy, Toby. However, this kind of 'wholesome family entertainment' was a tonic for audiences in the '70s and has perennial appeal. 1. The appeal of the film? The family, the leaving city life, the living in the wilderness, the capacity for building, surviving? Nature, animals? 2. The presentation of the ugly city at the opening, smog, industry, traffic, doctors, illness? The contrast with the wilderness and its beauty? The colour photography and locations? The special effects for showing life in the wilderness, the animals, nature and the trees and plants, crops? The song and its lyrics as a chorus during the film? 3. Audience response to city ugliness and the need for some kind of change? 4. The making of the decision about leaving the city, their having to repeat the decision after the various crises in the wilderness? The facing of the new venture, the flying in, the warnings of the pilot about people leaving? 5. The finding of the old hut and the humour of the bear? Building the new hut and the venture for all the family? The supplies they brought in (and having many clothes and quite a large amount of supplies! ), learning to hunt, shoot? Communication by radio, the breaking of the radio, the plane coming in, seeking help by canoe? The effect of such isolation? 6. The presentation of the animals, friendly and unfriendly, the racoon in the stove, the friendly bears, the cubs trained at home, the cougar cubs and the ferocious mother and the fight, the wolves and their pursuit of Jenny and the dog, the grizzly bear and its terrorising the household? What did they learn through their experience with the animals? The coping with fears, disabilities, threats? 7. The coping with the various dangers - the landslide, the cougar attack, the wolves, the flight from the bear, the storms and the snow, the rapids of the river? 8. The blending of pressures for survival with the joys e.g. the picnics, the sharing of nature with each member of the family? 9. The portrait of the parents - the father and his ability to cope, wisdom? The mother and her making the house orderly, her care for the children, support of her husband, clash with him after the dangers, her renewing her decision? The children and their lack of knowledge about the wilderness, the risks that they took, the dangers that they experienced? How well did they learn? The old visitor and his stories of the past, sharing hospitality, chasing his donkey? The doctor and his flying in? 10. The theme of survival, facing crises, standing by basic values? The presentation of the wilderness attractively and the criticism of the ugly cities?